From Goodreads: A twisty story about love, loss, and lies, this contemporary oceanside adventure is tinged with a touch of dark magic as it follows seventeen-year-old Wendy Darling on a search for her missing surfer brothers. Wendy’s journey leads her to a mysterious hidden cove inhabited by a tribe of young renegade surfers, most of them runaways like her brothers. Wendy is instantly drawn to the cove’s charismatic leader, Pete, but her search also points her toward Pete’s nemesis, the drug-dealing Jas. Enigmatic, dangerous, and handsome, Jas pulls Wendy in even as she’s falling hard for Pete. 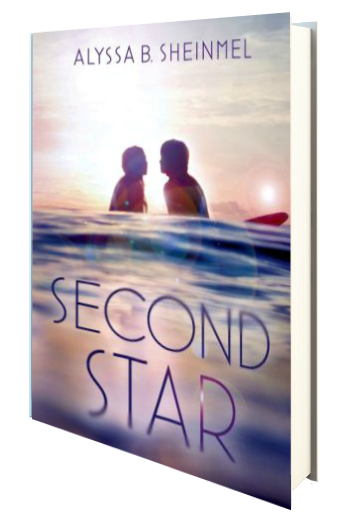 A radical reinvention of a classic, Second Star is an irresistible summer romance about two young men who have yet to grow up–and the troubled beauty trapped between them. I found this novel to be a very interesting rendition of Peter Pan, taking place on the oceanside instead of Neverland. Initially, I wasn’t sure I really liked the story. Wendy is wishy-washy, and while I was completely on her side in the hunt for her missing brothers, her tactics drove me crazy. Wendy just can’t seem to make up her mind–she loves Peter, she loves James. She loves Peter again, then back to James… and I was a little miffed with her back and forth “love affair,” secrets, and deceeits along the way. It actually wasn’t until Sheinmel threw in a twist near the very end of the novel that my perspective of the story changed, but change it did. The love story suddenly made sense, and every aspect that I previously had held qualms about dissipated. Yet one more reason that I insist on finishing every book I start—you never know what the author is going to throw your way. Now, I’m not a surfer girl, and this novel definitely revolves around the sport and is what ties the entire story together from the get go. But, it also deals with a lot more than just surfing, such as drug use, which I found fascinating and little bit jarring since this is a modern Peter Pan. Yes, it’s still a YA read, and no, I didn’t think the drug aspect was overpowering. There was actually a good message that went along with it, and though I never thought of Captain Hook as a drug dealer, well… Sheinmel fits it all together quite nicely, and I really loved how she tied in the Witch Tree, Fairy Dust, and flying from the fairytale to make it realistic and present day. Overall, Second Star was indeed very well done, and I just can’t get over the ending that turned everything on its head–giving readers something to really mull over in terms of facts, and that, in truth, is what really made this novel for me. Four stars. In exchange for an honest review, Macmillan Children’s Publishing Group has been extremely gracious in allowing me to read an ARC of this novel, via Netgalley.